COMING SPING 2019: THE ALL-NEW, ALL Electric VESPA ELETTRICA! Powering the new Elettrica is a lithium-ion battery and electric motor that delivers "continuous" power of 2 kilowatts and 4 kW at peak power and more than 147.5 pound-feet of torque, which ought to be pretty peppy in a Vespa. It boasts a range of 62 miles and is fully chargeable in four hours via a cable underneath the seat compartment — where the fuel cap is usually located — and a normal wall outlet. Two riding modes are offered, Eco and Power, in addition to reverse. The Elettrica X hybrid adds a gasoline generator to double the driving range, with a smaller battery pack that provides an all-electric range of up to 31 miles, with the generator kicking in automatically when the juice is drained or when the driver manually enters it by selecting Extender mode. 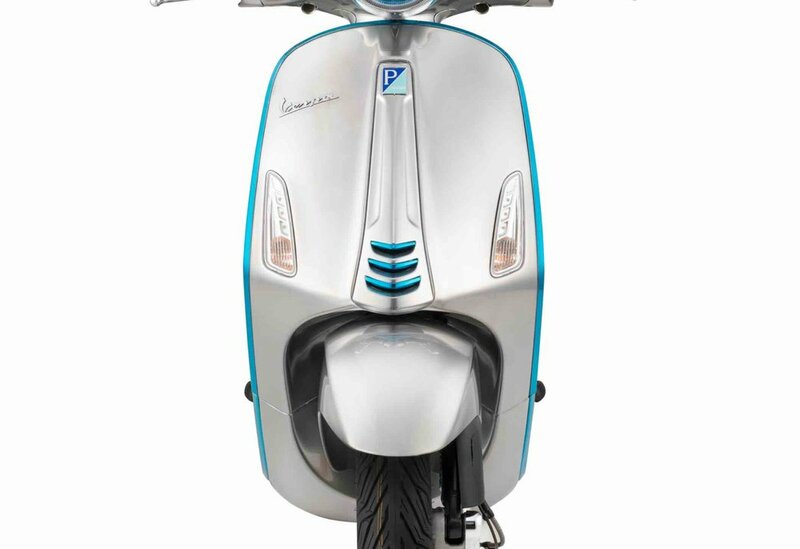 Piaggio is giving the Elettrica its own dedicated livery, with a special chrome grey finish with metallic reflections, but customers will have plenty of options for customizing their electrified Vespa, including seven color choices for things like the wheel rims, Vespa badge and seat trim. There's also a new LED front headlight. The big news is that both the Elletrica battery-electric Vespa and its hybridized Elettrica X version will be connected scooters, with smartphone integration through a 4.3-inch color TFT display that features a twilight sensor that can adapt the background and color of the characters to make it readable at all times of day. The screen list speed and battery charge, remaining range and so forth. But by connecting your smartphone app, you can get notification of incoming calls and messages, with keys on the handlebars to answer calls and use voice commands to make calls or play music, plus GPS data. You can even get a dedicated Jet helmet with integrated earphones and Bluetooth intercom. It'll be show at the EICMA show in Milan in November. Sales start in Europe and then begin in the U.S. and Asia early in 2019. When we have them in our showroom, we'll let you know!